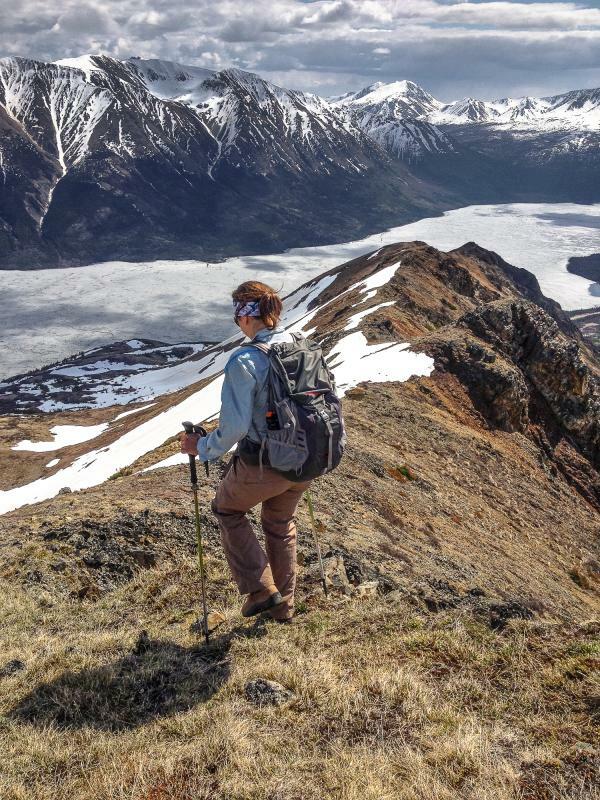 This hike offers sweeping views of Tutshi Lake and the surrounding mountains. There is a lot of steep scree to climb up to the ridge but it is a fun, narrow ridge to walk once on the top. 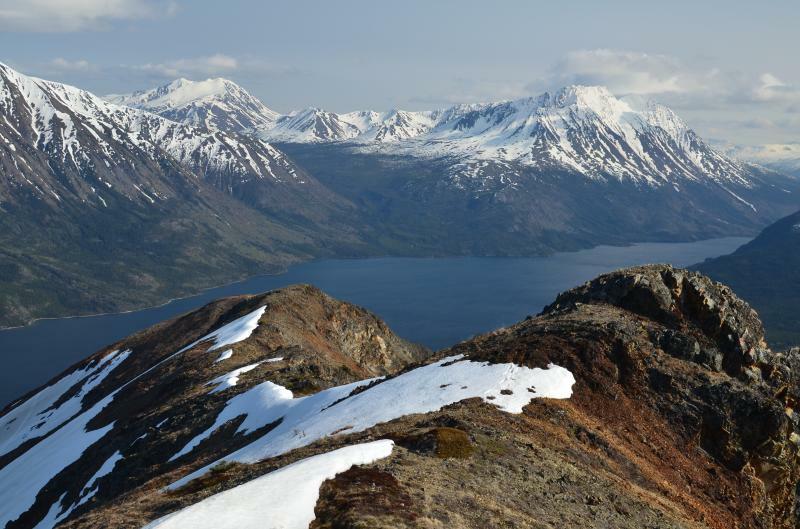 It is a favourite early-season hike as it is south facing with early snow melt. As a bonus watch for Mountain Goats on the ridge. From Whitehorse, drive south on the Alaska Highway to the Carcross Cutoff. Turn right on the South Klondike Highway and drive to Carcross. 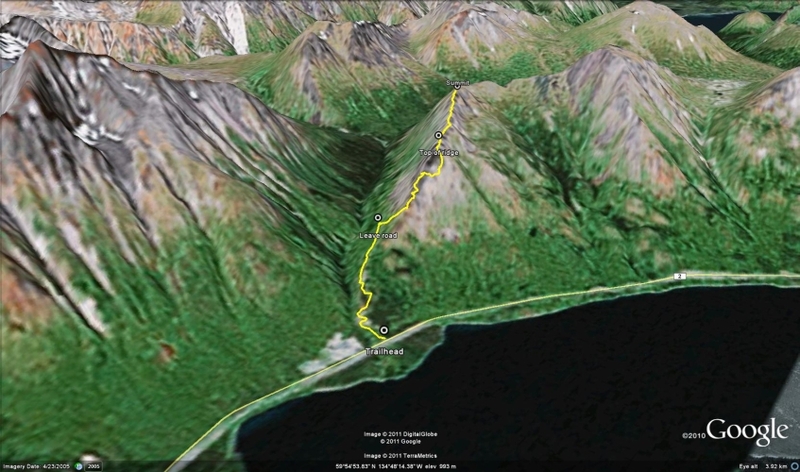 From Carcross, continue south on the highway for 38 km. You will reach a rough gravel road on the right side of the highway. Park here. It is just before a creek and gravel pit. The road is on the north side of a creek. If you come to a gravel pit (on the south side of the creek), you have gone too far. Note: There is no official name for this mountain. From the highway, walk up the steep gravel road. There is only one fork in the road. Stay left, although they meet up again very quickly. After about 1.7 km into the hike, the road comes close to the start of the ridge in front of you and minimizes the bushwhacking required to get to the ridge. Leave the road and head through the trees to the base of the ridge. The bushwhacking is not that bad and very short. Head up the ridge until you get to a large piece of vertical rock. Instead of climbing the rock, head right (northeast) across the steep scree slope in order to come around the other side of the ridge. This is the most difficult part of the trail, but don't be discouraged as it is actually easier coming back down. 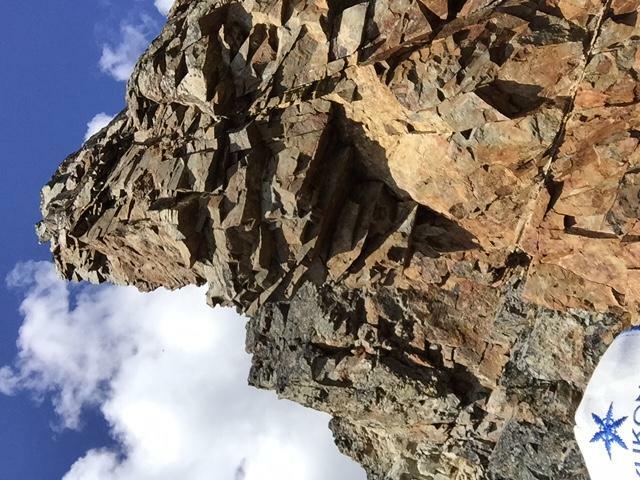 After walking on the scree slope for about 300 m, you will notice a route up above you that avoids all the vertical rock. Head straight up and you will come to the top of the ridge. The route from the top of the ridge to the summit is obvious, but is fairly narrow so be careful if there is still snow on top. From the ridge, you get a great view of the surrounding area and a closer view of Paddy Peak to the west (your left). Follow the same route down. Have you been to Tutshi Bend Ridge lately? We hiked to the summit yesterday. It was a challenging hike, made more difficult by our misunderstanding of some of the corrections in the comments below. We waited too long to cut toward the ridge through the trees and ended up hiking up the backside of the mountain (south west side). It was mostly scree, with some challenging chutes to shimmy up. I wouldn’t recommend it. We gained the ridge about 1/2 way up, which made for a pretty easy walk up to the summit. Not sure we caught the trail back down, but the route we found was much less sketchy than the way up. Mostly, we went down the north east side and hugged our way under the rocky outcrops until we reached the south side (with some adjustments depending on the scree). Then we picked our way back down toward the road. The view from the top gave a really good view of the smoke plume from the fire on the Windy Arm, but without suffocating in smoke, as the wind was blowing away from us. We were just under 5 hours up and back. We hiked to the top of the ridge (not summit) today (3 hrs). We followed the directions but (like Esther?) hit the ridge lower down, at the fist big rocky prominence. Going around the NE side of the lower knob was a tricky scramble, not advisable. (Aim for the second big rocky knob on the ridge.) This hike is worthwhile for the views, but you need to be comfortable with loose and crumbling rock on steep slopes. High risk of rockfalls. Note: there's a guy camped semi-permanently at the base of the hike. He tried to dissuade us from hiking it given the dangers. Did this hike on May 26. The side hilling wasn't super fun. We were too eager and topped out on the ridge too soon... had to backtrack and go back up. SO WORTH IT THOUGH! The views were stunning. This hike is clear of snow. Paddy peak and the road to get to it still has a lot of snow. Hiked this over the weekend. There was a more scree than we had expected, but it was OK overall. We didn't actually make it to the summit, as we didn't walk north enough/around the vertical rocks to reach the true summit and see around the backside of the mountain. Next time! Did this hike yesterday - great views over the lake. Hiking time was about 4.5 hours. For anybody interested in Paddy Peak, large sections of the access road are still snow-covered, from the point at which it leaves the main valley onwards. 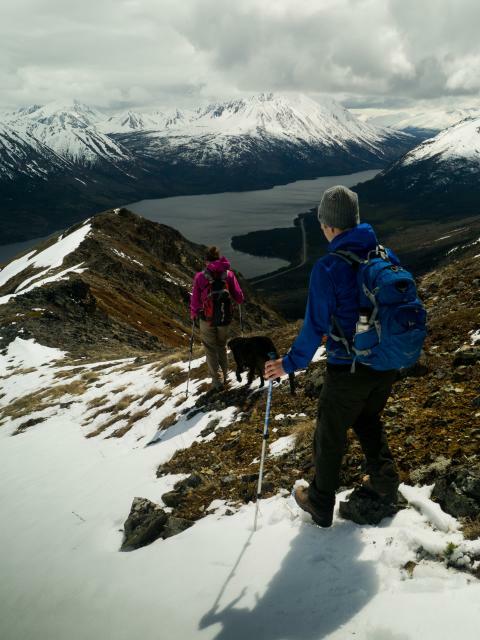 This hike is a spring favorite of ours, since it is one of the first trails to be snow-free. We saw ptarmigan, grouse, and one very large goat up on the ridge. It took us about 5 hours return, but we didn't spend much time at the top. The road below to Paddy Peak was still snowed in and there was lots of snow on Paddy Peak still. We hiked up Tushi Bend trail last weekend and it was snow free. The road had snow and there was 5 mins of bush-whacking to get on the hill proper but it was a great hike. A little short we were up and down in 2 hours with a 10 year old. The ridge was mostly snow free this weekend and the road only had a few wet patches on it. We took another route down from the ridge this time. We went down the south side of the ridge (the same side as the gravel road) a few hundred meters before the start of the ridge (where you initially climb up). It was steep! We had to descend one at a time because of the rocks that would fall as we moved. There are some areas like this on the route described on this page, but this new route was steep all the way to the bottom. Not recommended, stick to the same way you came up.